The news was a bitter pill to swallow for not just online poker players but also industry giants. The news has seen notable poker companies like Party Poker, and PokerStars stop offering games in Australia. Online-Poker-Australia.com is rallying support to repeal the ban so that we can play the game we love to play with the protections that we deserve. Show your support against the ban by joining the fight! Is Australian Government winning the war against offshore gaming? The passing of the Interactive Gambling Amendment Bill by the Australian lawmakers in August 2017, marked a significant milestone for the Australian Government in its battle to ensure consumer protection and responsible gaming in its citizens. It's been more than a year now since the bill came into law, and there is still a strong opposition against the law, although lawmakers still insist, the final decision was for the greater good of everyone. Are politicians right to say the bill has been beneficial? Or are oppositions right in fighting the bill? Well, to answer both questions, we would have to analyze if the bill has achieved its proposed goals. The fight to stop offshore gaming in Australia didn't just start last year, in actual fact, the slugfest began way back in 2001. It was back then that the Australian lawmakers began to drive offshore gaming out of town, by enacting the 2001 Interactive Gambling Act. But as luck would have it, some miswording in the law meant there was a loophole that made the law void. Since then, lawmakers have been working night and day to amend the original 2001 Interactive Gambling Act, and thus, the Gambling Amendment Bill of 2016 came into being. After the various legislative processes, the bill was finally passed into law in 2017. In simple terms, the bill states any unlicensed betting firm shouldn't carry out any form of business in the country. Failure to adhere to the law can see such companies face daily fines as high as AU$7.9 million. The buck doesn't stop there, as firms that do as little as advertise unlicensed gambling could face stringent punishment. In what many considers as a shady move by the lawmakers, there is no regulatory body, or agency set aside to handle the licensing requirements of the betting firms, and if there is no licensing framework, it, therefore, means that online betting activities like casino games, online poker, and bingo are all banished. The law doesn't shut out all forms of online betting, as sports betting and lotteries are legally authorized as the only form of online betting to Australians. Enforcing the law is something that the Australian Communications and Media Authority (ACMA) has been tasked with by the government. Their job is to fish out firms that violate the Australian Gambling Law in one way or the other. The ACMA has been very strict in their pursuit for offenders, and they've taken it upon themselves to see that the law is followed to the letter. The ACMA is able to achieve its desired results by employing several strategies to discourage online betting outlets from opening their doors with Australians. One of such strategies is working hand in hand with the various international regulatory bodies to ensure violators are severely punished both in their local front and in the international community as well. Another strategy the ACMA employs is sending cease-and-desist letters to violators. These letters usually contain warnings of the possible large fines that awaits offenders should they persist in their erroneous ways. Sometimes, the ACMA goes as far as communicating with web hosting companies and third-party payment processors, in a bid to discourage these outlets from doing business with violators. Since the enactment of the law, and the military-like efforts of the ACMA to see that it is adhered to, several online gaming providers have closed up shop and moved out of the Australian market. On second thought, there are several countries that implement the same rules as Australia in prohibiting online gambling within its shores, but such countries have not experienced the same number of high profiles exists as observed in Australia. We can only conclude that the ACMA is using an iron whip behind the shadows to drive out firms that aren't comfortable with the new rules. From all indications, the ACMA is satisfied with its performance thus far, and they even published a report in October 2018, detailing their victories in the past 12 months they've policed offshore gambling sites. A quick scan of the report shows that it is written to paint the ACMA In high-glory as they claimed they'd made giant strides in policing online betting. From the report, the ACMA claim to have driven "33 popular online gaming sites out of Australia." As the report goes on to state, their success is down to 77 investigations carried out by the ACMA, through its own initiative and also following complaints and inquiries lodged by the general public. The ACMA also praised itself on the report for decreasing gambling spend by 50% in just 12 months, citing the figures from Global Betting and Gaming Consultants as an indication of their progress. The figure mooted as the total expenditure for 2018 rests around AU$200 million. A self-published report by any authority on its actions will always give itself high praise, and try to cover the cracks, and it will appear the ACMA did just that. The ACMA's description of their bullish strides to curb the actions of non-compliant betting sites paints a somewhat progressive picture, but on a closer look at the report, there are too many discrepancies that can't be ignored. After praising its efforts to bring gaming expenditure by 50% in just 12 months. It turns out that the actual value as highlighted by a stat from H2 Gambling Capital Project in the same report is a measly 7% reduction, and not the 50% mooted by the ACMA. The general public is still apprehensive towards the actions of the ACMA to hunt down non-compliant foreign sites. This fact is further supported by a recent study on Australians betting on foreign websites and those on local gaming outlets showed that only 19% took into consideration the actions of the ACMA when selecting a site, and also just 5% really cared about consumer protection when choosing a site, and lastly only a measly 2% consider responsible gaming features as a factor they looked at for when selecting a site. The Australian Online Poker Alliance, a player advocacy group for gamers strongly rebuffs the report put forward by the ACMA calling it outrageous and subjective. The AOPA has been at the forefront of opposing the Gambling Amendment Act since its inception. They've fought a righteous war over the years, spearheaded by the group founder, Joseph Del Duca. Citing his own finds, and research, Del Duca who is the Head of Communications and Social Media of Global Poker went on to explain that while the efforts of the ACMA and the amended gambling act has seen the end of 33 unlicensed operations, in the country, they have since been replaced by others. It is now a case of cut one, and three more appear. "We spoke to lots of Australia poker players, and it would amaze you to know that not one person has stopped playing. Online poker is still on in Australia, each player simply went to different sites, when the old one closed shop." Although several sites have sprung up to fill the void left by the big hitters, they do lag behind I terms of performance and function, and one major drawback they have is the fact that they pose more risk to players. An excellent example of how these new sites pose a grave risk to players is the play money social poker apps. These apps are advertised as practice apps, with no real cash involved and zero stakes. However, with the aid of third-party agents, the fake chips used in the apps can be converted to actual money and used to play. The risk now factor is now the third-party agents who at any time, can run off with the money of users. This risk factor is not experienced in the more established offshore poker sites, where users are more at ease with their earnings and cash. 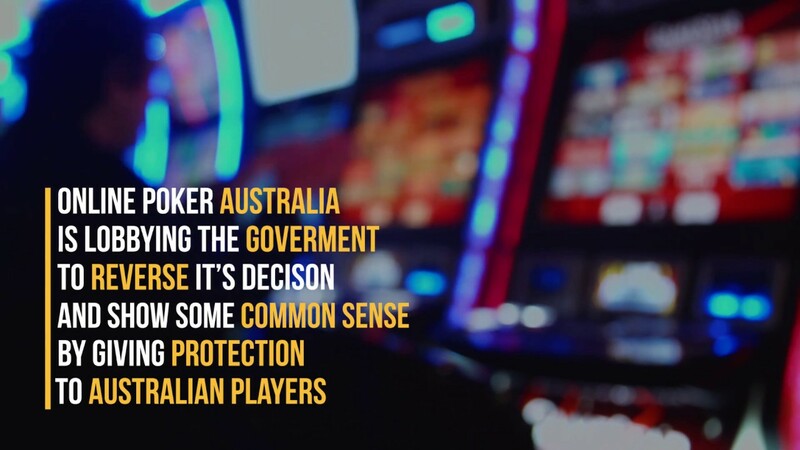 ACMA is still holding its stance that it is doing Australian citizens a massive favor by ensuring offshore online poker sites are driven from the country down under. But it would seem its attempt to be the parent of all Australian citizens might just Mae things worse, as people will continue to play online poker, and rather than play in reputable and longstanding firms, they now have to result to untrustworthy newbies, where they face a higher risk than never before. It will seem that the Australian Government is embarking on an entire crackdown on any form of online gambling, and that includes offshore gaming firms and even the licensed local gaming enterprises as well. All thanks to the Point of Consumption taxes (PoC taxes), online bookmakers have to pay certain licensing levies, and also additional levies based on which part of Australia the user is located. So, licensed outlets will end up paying up more and more. Victoria didn't waste any time in passing an 8% PoC tax, which will be launched 1st of January, 2019. That's not all; stringent Australian gambling advertising rules came are not making things easy as well. Since its inception at the backend of March 2018, broadcasters have been banned from showing betting ads during the coverage of any live sporting event. This prohibition is detrimental to online sports betting sites, who rely on such ads to attract customers. Much has been said about the National Consumer Protection Framework (NCPF), and its role in protecting citizens from falling prey to the unforgiving world of online betting, with the government praising it as the next best thing since sliced bread. But one cannot fail to see the double standards involved with the NCPF. The word is that the NCPF is formulated to prevent citizens from the harsh dangers of online wagering, but fail to see that "this perceived dangers" of online betting should be applicable to physical betting houses. The NCPF is tailored for online wagering with no inclusion of physical facilities. The double standard is so glaring, and you won't be wrong to guess that some serious politics are going without the knowledge of the people. TABCORP and other brick-and-mortar gaming facilities in the country will definitely have something to do with the NCPF. With each passing day, more and more reliable online gaming services are finding their way out of Aussie land, and it seems the average Australian bettor is now finding it challenging to find a decent place to play online poker and other casino games. Well, the good news is that there is still hope for you and you don't have to rely on some dodgy app to play your favorite games. There are still some companies that still operate within the shores of Australia despite the threats of ACMA. These companies bear the burden of anything the ACMA will throw at them, leaving you without any worry or legal suit. So how do you go about finding these sites? Well to make the process easy for you, we've created an Australian online poker guide detailing the best poker sites Australians can play in, and you will be surprised just what has been hiding under your nose all this while.